These are available as free downloads upon purchase. **New: Regional Maps Introduction – A brief commentary on the first section in the Satellite Bible Atlas. You can learn more and see sample photos here. Josephus needs maps, and this edition includes 40 maps. They are on the same page as the events, so you don’t have to flip around. Almost every page has a photo or illustration of some kind. I love full-color double-page spread aerials of Masada, and I love architectural renderings of Herodium and Roman Jericho. This makes an exciting history even better. The color-coded text makes it easier to read, with personal names in red, place names in blue, and references in green. This edition provides both reference systems (Whiston and Loeb) so it’s easy to find your place no matter how another source cites it. Carta’s Illustrated The Jewish War uses the venerable Whiston translation and the maps follow the numbering system in The Carta Bible Atlas, with a table cross-referencing these to The Sacred Bridge. Carta is offering 30% off through June (with the code “30-off,” bringing the price from $60 down to $42. They’ve also reduced shipping to $5 (from Israel) during the sale as well. This is a great deal on an essential resource. Perhaps a further word for those of my readers who are not aware of how important The Jewish War is. If you know anything about the first century in Israel outside the New Testament, there’s a good chance it came from this book. There are other sources, but The Jewish War is the best, because it is (1) contemporary, (2) lengthy, (3) interested in subjects related to the New Testament, like Jerusalem, temple, Herod, Galilee, and Pharisees; (4) generally accurate as it was written by a historian who was eyewitness to so much. I will be leading a group of students throughout Israel for the next three weeks and probably not a day will go by when I am not quoting or referencing this book. I encourage my students to read it, mark it, and keep it handy. Last week, the Israel Antiquities Authority took a first step in the plan by commencing a complicated and extraordinary archaeological excavation in search of scrolls in Nahal Tse’elim. A team from the IAA’s Unit for the Prevention of Antiquities Robbery accompanied by researchers from the Caves Research Center of the Hebrew University and hundreds of volunteers from across the country is participating in the excavation, which is taking place with the support of the Heritage Project in the Ministry of Jerusalem Affairs. The excavation is being directed by archaeologists Dr. Eitan Klein, Dr. Uri Davidovich, Royee Porat and Amir Ganor. For many years, IAA inspectors have been proactively enforcing the law in the desert, during the course of which they have made a number of seizures and foiled bands of antiquities robbers that sought to become rich through the detrimental exposure of items of great historical importance. However, these actions are a mere drop in the ocean and the Israel Antiquities Authority stresses that only by excavating all of the scrolls in the ground and transferring them to the state, will it be possible to ensure their well-being and preservation for future generations. 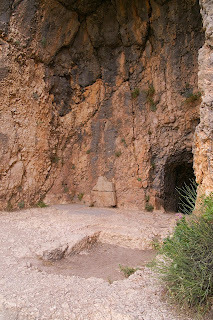 The Cave of Skulls, where the excavation is taking place, is located about 80 meters from the top of the cliff, and c. 250 m above the base of the wadi. 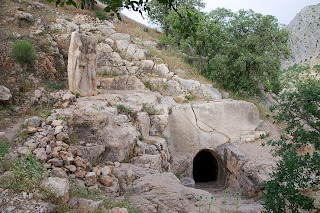 Because of the difficulty in reaching the site, the Israel Antiquities Authority obtained a special permit from the Nature and Parks Authority to construct an access trail, which requires the use of rappelling equipment for the safety of the participants in the excavation. More than 500 volunteers and field personnel from Israel and abroad were required for the undertaking, and they are sleeping and living in a camp in desert field conditions. Many requests by individuals offering to participate have been denied because of the lack of infrastructure to provide for such a large group of archaeologists, volunteers and interested parties. 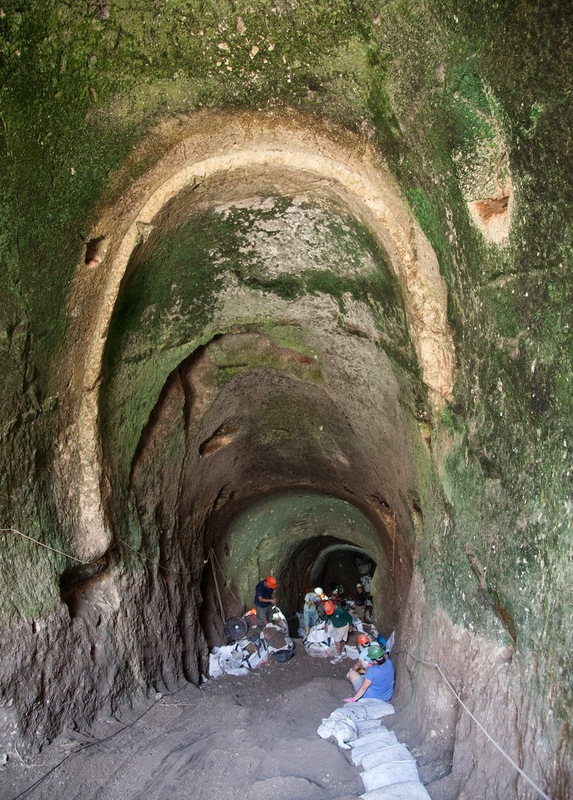 The current excavation season will end in another two weeks, assuming this will be sufficient time in order to extract the valuable archaeological information from the cave. 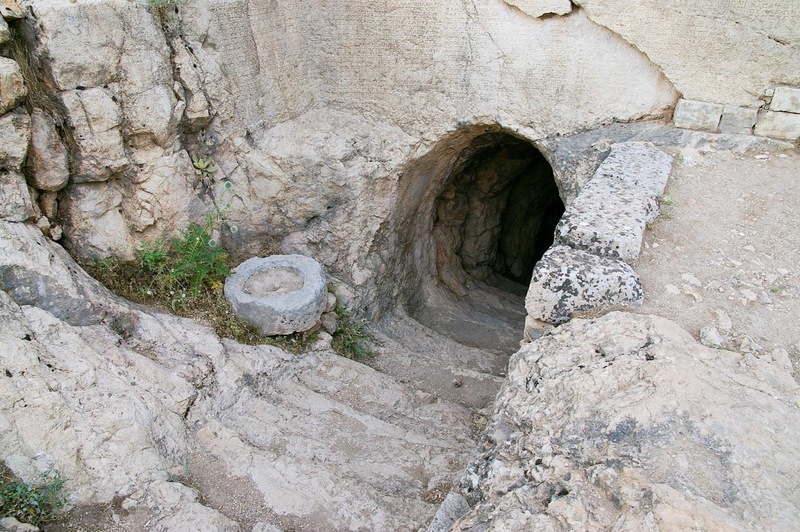 According to Amir Ganor, director of the IAA’s Unit for the Prevention of Antiquities Robbery, “The excavation in Nahal Tse’elim is an operation of extraordinary complexity and scope, and one that has not occurred in the Judean Desert in the past thirty years. Despite the rigorous enforcement actions taken against the antiquities robbers, we still witness acts of severe plundering that unfortunately are possible in such large desert expanses. 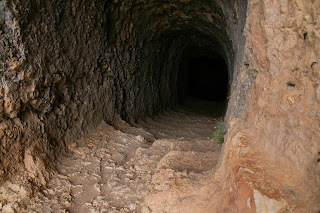 There are hundreds of caves in cliffs in the area, access to which is both dangerous and challenging. In almost every cave that we examined we found evidence of illicit intervention and it is simply heart-breaking. The loss of the finds is irreversible damage that cannot be tolerated”. 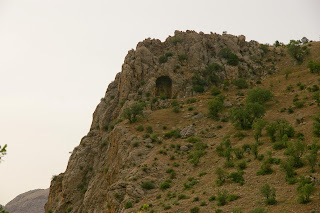 The cave where the archaeological excavation is being conducted is situated c. 80 meters from the top of the cliff and c. 250 meters above the base of the wadi. Photographic credit: Guy Fitoussi, courtesy of the IAA Unit for the Prevention of Antiquities Robbery. Arutz-7 has posted a 1.5-minute video. Archaeologists working at Jerash (biblical Gerasa) have discovered part of a life-size statue of Aphrodite. 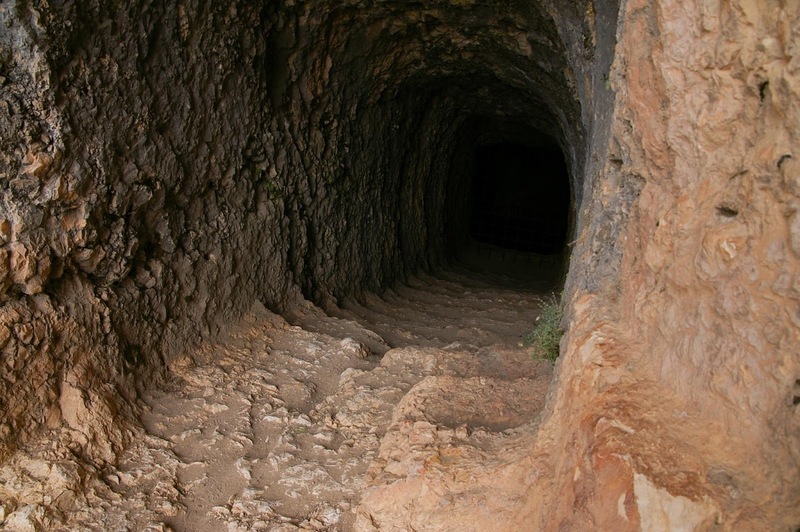 “American and Egyptian archaeologists have discovered a rare structure called a nilometer in the ruins of the ancient city of Thmuis in Egypt’s Delta region.” It was built in the 3rd century BC and used for 1,000 years. British archaeologists have identified the remains of a 16- to 18-week-old mummified fetus that was found in Giza nearly 100 years ago. The Antiquities Ministry of Egypt has completed a project to lower the groundwater at the Edfu Temple. A plan has been approved that will remove all the mines around the traditional area of John’s baptisms on the Jordan River. Haaretz (premium) visits the site of Tell el-Ajjul, once a prosperous Canaanite city south of Gaza but today at risk of complete destruction. “Those who trust in the Lord are as Mount Zion which cannot be moved but abides forever” (Psalm 125:1). Wayne Stiles uses photos to explain what this means today. Two archaeology students have crowdsourced images to create a VR reconstruction of the Mosul museum. The article includes a cool YouTube 360 video. The Palestinian Museum opened this week in Bir Zeit, but it has no exhibits. The enforcement of a new antiquities law is making it harder for black market antiquities to be sold in Israel. Israel will be returning two Bronze Age wooden anthropoid sarcophagus lids found by IAA agents in an Old City dealer’s shop. Of 28 Egyptian obelisks standing today, only 6 are in Egypt. That's one of many interesting facts about obelisks in a WSJ article that is based on a book by Bob Brier entitled Cleopatra’s Needles. Allison Meier reviews the new exhibition in NYC, “Gods and Mortals at Olympus: Ancient Dion, City of Zeus.” The article includes many photos. Charles Jones has recently updated the list of titles in JSTOR which focus on Antiquity. It now includes 243 titles. Dubgallu is a new forum for scholars of the ancient Near East. Registration is free, and open to anyone who academically studies the ancient Near East. There’s a sale on for various electronic editions of the Zondervan Illustrated Bible Backgrounds Commentary, Old and New Testaments – Logos, Accordance, and Olive Tree. The Atlas of Palestinian Rural Heritage looks interesting. Some themes covered: Tilling - Harvesting - Moving the Harvest - Threshing - Sifting - Grinding - Making Dough - Baking Bread - Cooking - Making Grape Syrup - Sesame Oil - Olives and Olive Oil - Storage - Bard - Domestic Birds - Honeybee Farming - Milk - Shepherd - Washing - Water - Gathering Rainwater. If you have a passion for biblical geography, perhaps you would consider supporting Seth Rodriquez to go to Zimbabwe to teach future pastors about the land of Israel. This is a great opportunity to help others learn about what we love. I’ll be traveling for a few weeks and the regular roundups will resume when I return. On this day 50 years ago, David Bivin took this photo while standing on the edge of no man’s land looking toward the Old City of Jerusalem, then occupied by Jordan. Photo from Views That Have Vanished. Two scuba divers made the find of a lifetime last month when they discovered a shipwreck dating to the 4th century AD. In what has been called the most extensive underwater discovery in Israel in 30 years, the divers found statues, anchors, and lumps of coins, all remarkably well preserved on the seabed near Caesarea. The following quotations and photos are from the IAA press release. The IAA press release includes a 2.5-minute video. All of the high-resolution photos may be downloaded here. Unless otherwise credited, all photos are by Clara Amit, courtesy of the Israel Antiquities Authority. The story is also reported by The Times of Israel, Haaretz, and others. A leaked report of a scan of King Tut’s tomb suggests that there are no hidden chambers. A few days earlier, scholars at a conference disagreed on the significance of radar scans. Three tombs on the west bank of the Nile in Luxor are being opened to the public for the first time. The symphony orchestra of the St. Petersburg Mariinsky Theater performed in the Roman theater of Palmyra recently. The collapse of one of the walls of Solomon’s Pools has raised concern that the entire pool could be in danger. 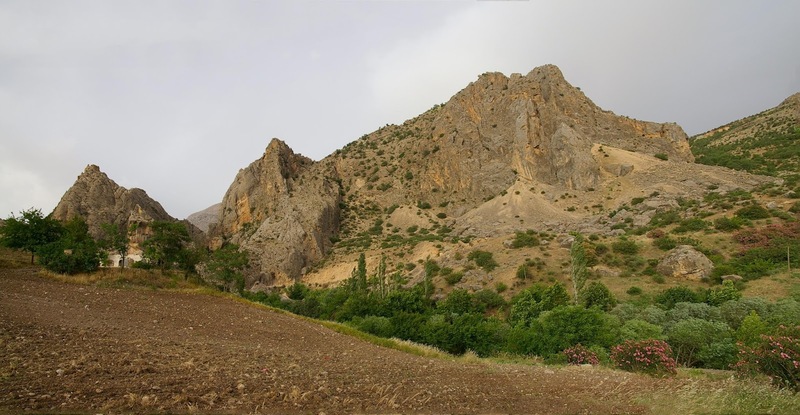 If you’ve never visited the site of ancient Dan, this article is a terrific introduction, drawing out the biblical history, making sound application, and illustrating with numerous photos. A new 15-volume series entitled the Dead Sea Scrolls Editions will be published by Brill. The ASOR Archive Photos of the Month is an easy way to revisit the past. Archaeologists have discovered the weight-loss diary of the prophet Daniel, according to a report in the Babylon Bee. Although he has never worked for the Israel Antiquities Authority -- Barkay says he prefers a university framework that offers freedom of opinion and thought -- he has acquired an international reputation thanks to two things: The first is the historic discovery of the Priestly Blessing Scrolls, the most ancient archaeological discovery of a biblical text dating to the period the Bible is believed to have been put together. The discovery of the scrolls had wide-ranging influence on biblical research, and the assessment of its historical reliability. The second is the project of sifting dirt from the Temple Mount. Barkay describes the Mount as "a black hole in the history of archaeology in general and Israeli archaeology in particular." "I got to Ketef Hinnom in Jerusalem, which is where I found the scrolls, through theoretical calculations. I tried to put myself in the shoes of the ancient residents of Jerusalem and ask myself where I would hold various activities that were part of the city but not inside it. For example: Where would I bury the dead? Or grow vegetables? Where would I set up army camps or quarry building stones? I looked for places that would meet the paradoxical demands of close enough and far enough. "When I checked the map, these all coincided at the site where St. Andrew's Church is located today, near the Menachem Begin Heritage Center. I also discovered that Josephus Flavius' literary description put the siege camp of Pompeus in 63 B.C.E. there; that this was where Titus ' fortifications had been when he laid siege to Jerusalem in 70 C.E." Gabi Barkay was born in 1944, the day his mother, Rachel, arrived in the Budapest ghetto. His father, Eliezer Breslaver, who later hebraicized his last name to Barkay, was imprisoned in a Nazi labor camp in the Ukraine. The young Barkay and his mother avoided the death march from Budapest to Vienna. In January 1945, the Red Army entered the ghetto and liberated them. "Many owe their death to Josef Stalin. I owe him my life," Barkay says. Gabriel Barkay and Michael Avi-Yonah on the Temple Mount in 1968. Photo by David Bivin. Gabriel Barkay teaching on the southern steps of the Temple Mount in 2006. Shmuel Browns reviews the new “Pharaoh in Canaan” exhibit at the Israel Museum and shares many photos. Carl Rasmussen gives two reasons why he likes to visit Magdala. Haaretz posts several impressive photos from this year’s celebration of the Samaritan Passover. Tom Powers visits the Pools of Siloam through photographs of the American Colony. He also suggests (in a comment) that both pools existed from much earlier than the time of Jesus and he proposes distinct purposes for each. Fifteen years after the excavation of the “Cave of John the Baptist,” Popular Archaeology revisits the site with James Tabor. Birket Ram is an interesting lake in the Golan Heights. Ferrell Jenkins looks at several historical sources and shares a wide-angle photo. Leon Mauldin pays tribute to Ferrell Jenkins on his 50th Anniversary Tour. A slackliner walked from one tower to another in the Tower of David Museum. Video here. A 23-year-old Israeli hiker fell to his death when climbing in Wadi Rum in Jordan. An oil deposit has been discovered near the Dead Sea. The Biblical Museum of Natural History opened in Beit Shemesh in 2014. It’s time to stop referring to the urban legend about NASA discovering Joshua’s long day. Emek Shaveh has petitioned Israel’s Supreme Court to halt the transfer of the library and artifacts from the Rockefeller Museum to west Jerusalem. The Israel Antiquities Authority has responded that they’re only moving the library to protect fragile books. Archaeology of Jordan Online went live this week. They provide a lot of great links (but don’t yet list our photo collection). Revue de Qumrân is finally available on JSTOR. 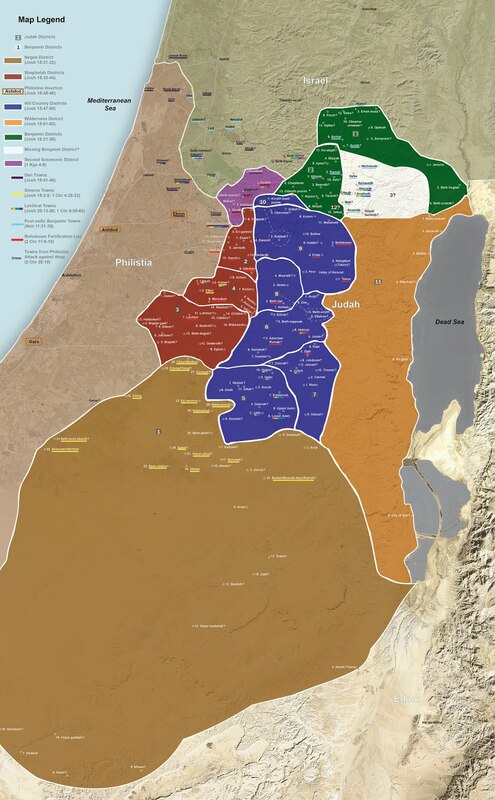 The tribal town lists and boundary descriptions in the book of Joshua (chapters 13-21) are the most significant textual sources for the geography of the ancient Israel/Judah since they contain the vast majority of place names mentioned in the entire canon. In a soon-to-be submitted (and hopefully accepted) dissertation, I deal with the specific identifications of all of the towns and topographic markers mentioned in Joshua 15 (Judah); 18:12-28 (Benjamin); 19:1-10 (Simeon); and 19:40-46 (Dan) within the framework of a larger argument about the date and purpose of the town lists of Judah (Josh 15:21-62) and Benjamin (Josh 19:21-28). Over the course of the project, I compiled a digital archaeological database/atlas of all of the sites mentioned and discussed in the dissertation (embedded below). This project is called the "Interactive Map: A Historical Geography of the Administrative Divisions of Judah: The Town Lists of Judah and Benjamin in Joshua 15:21-62 and 18:21-28" (click to open in a separate window). The entire map is searchable and each entry (click on each button to expand) includes the biblical place name (in English, Hebrew and Greek), the identified ruin with an archaeological breakdown from the Middle Bronze until the Byzantine period including the Iron II size in dunams, and a bibliography of the archaeological data. The bibliography for the archaeological data contained in the database/atlas can be accessed here. Satellite Bible Atlas users may also be interested in a more traditional map of the town lists/administrative division that I have prepared using the SBA's base map. A PDF of the map can be accessed here. I have added a JPEG version of the map below.